I got in all my runs this week, though some were a little shorter than what my training plan says as I recover from that weird foot thing that happened. My steady paced run on Wednesday was pretty mentally tough. No walk breaks for the four miles (took one briefly after my warmup before I started the steady pace) on the treadmill. 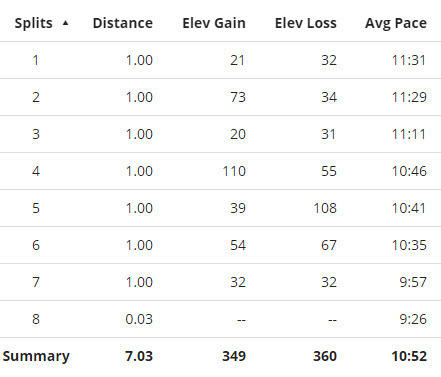 My steady pace is 10:45-11:15 min/mi and my average for those four was 10:59 min/mi, so looks like I did it perfectly. I am, however, now absolutely terrified of my goal pace four mile run next week, which is the exact same thing but faster. I really wish I could do these specific pace runs outside, to make sure I really can feel the pace. I’m thinking I might start heading out to the group run before the rest of the group shows up, getting in a mile or two and then finishing up with them (they typically do 3-4 miles). I’m a little apprehensive about this week. This is the first week with speed work AND running five days a week. Not sure whose great idea it was to plan that for the week of Christmas, so we’ll see what I can actually fit in.